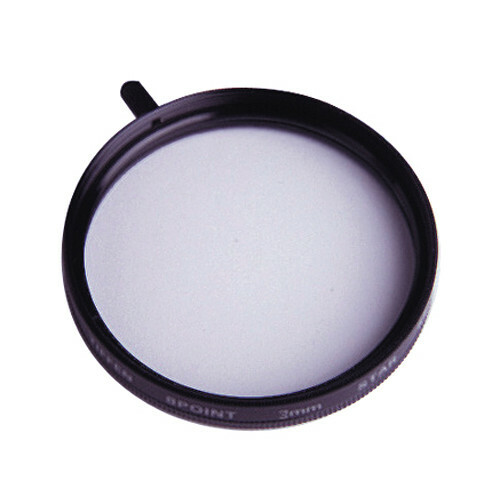 Tiffen Filter Wheel 3 3mm/8pt Grid Star Effect Glass Filter create multiple points of light, or "stars," streaking outward from a central light source. These filters come in a rotating mount for critical placement of the star effect. Wedding photographers will especially appreciate the value of this filter. When it comes to special effects shots, why not offer your client a table shot of the menu or invitation next to a glowing, star-filled candle? Note: With an 8 point filter, the many star lines may tend to overpower the rest of the image, so use it carefully. Generally, mid-range apertures or larger are sufficient to achieve a good star effect. Always test before critical situations.